Is everyone all excited for Valentine's Day? I've seen so many of my blogging friends post their pretty Valentine outfits, desserts, and decorating ideas this past month. I know Valentine's Day often gets a bad rap for being over-commercialized, but I LOVE Valentine's Day. First, it's so nice to have a holiday in the middle of winter; I mean, can you imagine getting through January, February, and most of March without one? Second, I love that there is a holiday dedicated to "love". I celebrate all the "loves" in my life on Valentine's Day. My children, granddaughter, and husband all get handmade Valentine's cards and small gifts from me! Many fashion bloggers are posting pictures of themselves wearing red or pink dresses, but here in Wisconsin it's been a very cold winter. Most days have been below zero or in the single digits, and we are all growing a little tired of it. So when deciding what to wear for Valentine's Day, I had to skip the skimpy dresses, and opt for a sweater and jeans instead. I picked this floral cardigan because what is more romantic than flowers, right? I chose a blush velvet tee to wear underneath the cardigan. The blush color is a traditional Valentine color and velvet is a very romantic texture. I decided on black pants and black over-the-knee boots because black is my husband's favorite color on me and he loves OTK boots (what guy doesn't, right?). I couldn't decide if I liked this outfit better tucked in or out, so I included both versions and decided to let you decide. Here it is tucked in. And here it is un tucked. Which one do you prefer? 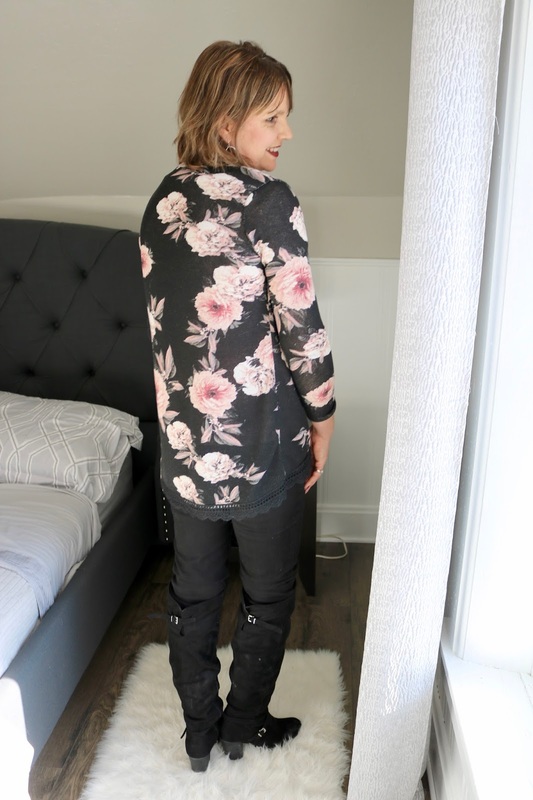 I purchased the floral cardigan this past fall at Charlotte Russe. Mine is no longer available, but I love this white floral version for spring. For jewelry I chose a necklace and earring set from Liz Claiborne. Other than my wedding ring, I picked two silver rings to coordinate with the silver necklace and earrings. I have shown this floral cardigan to you before. I wore it to another romantic event: a weekend at a Bed and Breakfast. I must look at this cardigan and always think "romance"! :) Here I wore it with all black: A black tank top, black leather leggings, and black ankle booties. So what about you? Do you have any big plans for Valentine's Day? I'd love to hear from you! Looking ready for Valentine's romance in this pretty outfit, Amy. It's beautifully put together and I've surprised myself as I prefer the belted look, even though I was sure I wouldn't! Hugs, x. Thanks so much! I think I prefer the belted look better too! Valentine's Day isn't such a big deal here so we don't have anything special planned. I might try wear red or pink, if I remember, haha! Love your floral cardi - it's perfect with the pastel top and I really like it tucked in and untucked, it's good to have a top you can wear multiple ways like that. Thanks Mica! That's funny how some holidays are more popular in some countries and not in others. It's a pretty big deal here in the states! Well you look pretty rocking and beautiful, Grandma! What a great outfit for Valentine's day Amy. I think the cardigan is perfect for the occasion! I kind of like it more un-tucked, but it looks great both ways. Not too much planned for the day over here...it was never really celebrated where I grew up (Mardi Gras was a big celebration always in February which also helped getting through the winter). But hubby usually gets me some flowers and I love to bake some cupcake with heart shaped sprinkles. Then of course we always get a little something for the kids. I guess we do more than I thought we do :-) I do get annoyed though by the over commercializing of every single holiday. It makes me feel like I don't do/give enough...luckily I've stuck to the little things and am not so easily influenced by it all. I just adore how you are taking photos from the fashion haus that is your lovely, recently renovated bedroom. Does you hubs play photographer? I cannot get PC to help much with that at all. Perfect Valentine's day outfit. That cardi is so pretty. Love the detailing around the hem and that nice, longer length. And the minute I saw your velvet tee, I wanted one. I think it would be perfect with my tulle skirt that I won't be wearing because of my dumb orthopedic shoe on my broken foot. But the minute that shoe comes off, look out!!! Thanks Leslie! Yes, it's been so cold here this winter it's difficult to take pictures outside. Then, if I do go outside, I can't go past my porch or the wood pile because of all the snow...it's so deep it covers up my shoes or ruins them. Hubby does take all my pictures (sometimes my daughter does too) and he loves it! He enjoys photography. Amy, this is such a pretty Valentines look. I love the pink flowers on your cardigan and the pink top underneath! I wore pink today myself! This is one of my favorite holidays too---partly because it's our anniversary also!! I think your cardigan is absolutely lovely, and it'll be perfect for so many occasions!! Awww, how sweet! Happy Anniversary! That's a great Valentine's Day outfit! I love the cardigan! So cute! I love the floral kimono and I think I like the shirt untucked best. It goes with the flowly feel from the kimono. I think its such a great pick for a Valentine's day outfit for those places where the sun is not shining and hot all year round. Thanks so much! It is always so cold here on Valentine's Day! Thanks so much! We did a little celebrating already this weekend, but we have something special planned at home for Valentine's Day too! Thank you! Happy Valentine's Day to you too! Such a pretty outfit, Amy! I adore your cardigan! Dark floral is my fave! Wow Amy, that cardigan is SO pretty! I love the way you styled it with both the black and the pink top. I think I prefer the pink top untucked but honestly it looks good either way. 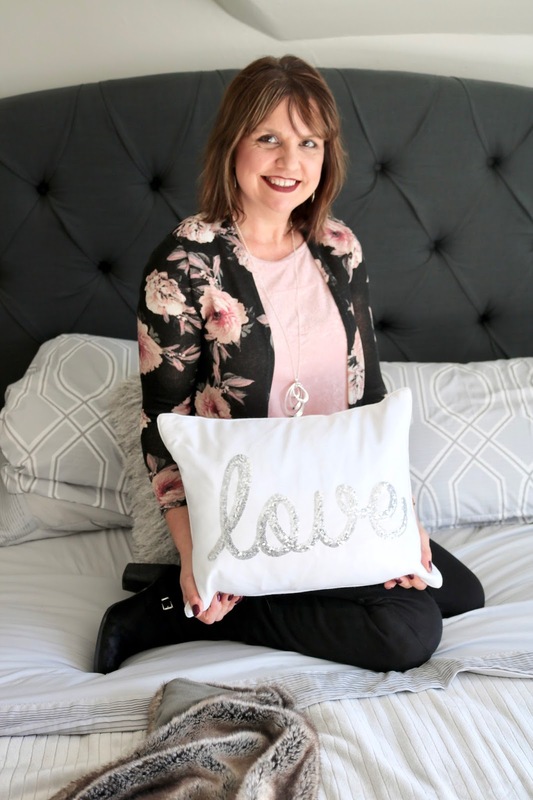 Love your bedroom too - so chic! Thanks Gina! It seems most like it untucked, though there a few who prefer the tucked in version too! You look so fabulous, Amy. You did such an amazing job styling this outfit. So chic! Amy you look absolutely radiant in these pictures! Your bedroom is so beautiful too. Love the cardigan on you. I think this is a great look for Valentine's Day! 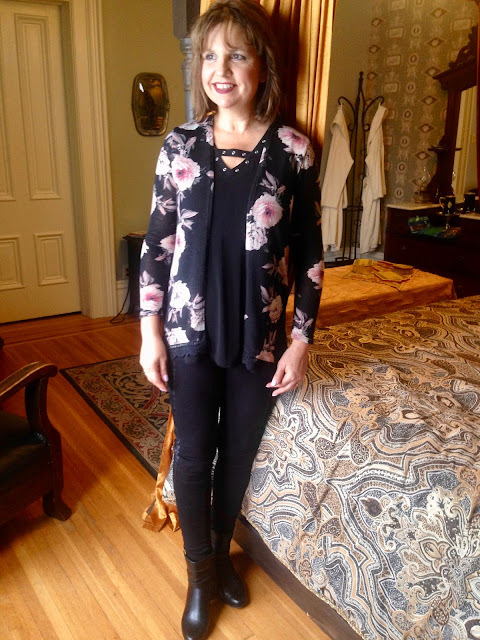 The floral cardigan is beautiful and looks great against your blush blouse. I like the top tucked, but maybe that's because I am generally a tucker. :) Thanks for linking up with Fabulous Friday, Amy! Thanks Jennie! You're one of the few who like it tucked...untucked seems to be winning. Yes, and I have worn it a few times before too! Thanks Michelle! What a pretty cardi! I love the print and you paired it so well with the pretty pink! 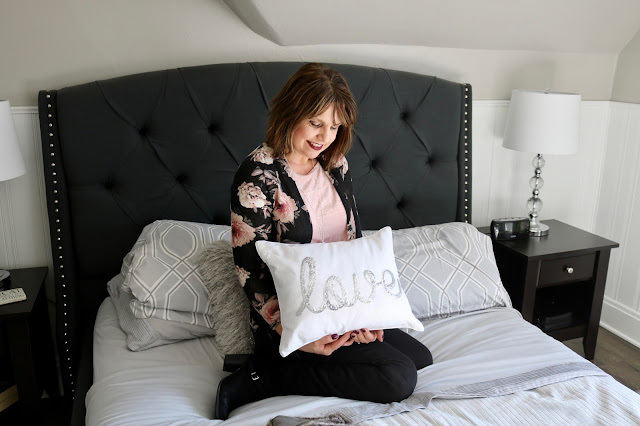 Such a pretty floral cardigan; and I love that "love" pillow! Thank you! 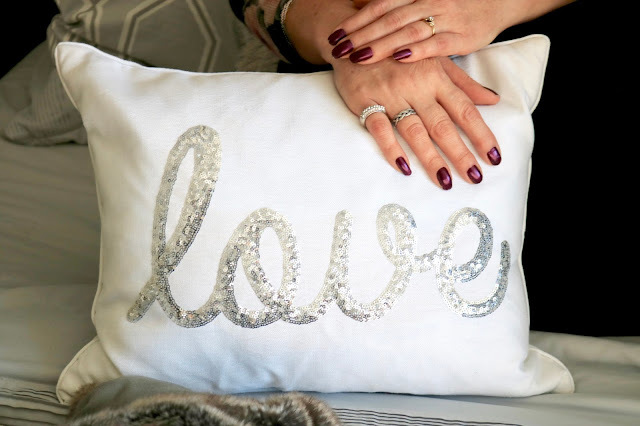 I "LOVE" that pillow too! I'm so happy I found it!